Appearance: Very dark, burnt caramel color. Slow, sticky necklace. Nose: Classic grassy KC nose. Alcohol, cut grass, woodruff, allspice, dried orange rind. Palate: Burn, cayenne, vanilla custard, orange, chewy oak. Finish: Hot & herbal with big oak. Parting words: Long time readers will know that I never buy whiskey this expensive and that I whine about value even for bourbons as cheap as $20. So why did I buy this one? I don’t know. It was available for one, and I love Knob Creek for another. It had also been a couple months since I had purchased any spirits so I figured it was in the budget. Let me start off by saying that Knob Creek 2001 is a good bourbon. It’s certainly the best Knob Creek I’ve every had. It has the big velvety tannins one would expect from a bourbon of this age. It’s firmly within the standard KC profile with pleasant spicy and herbal aromas and flavors. If this were a bottle of the old 9 y/o or of the single barrel KC, I would be very impressed. As a $130 limited edition, I’m underwhelmed. For that kind of cash, there needs to be more going on. More candy, more fruit, more of something. It certainly needs more proof. I’m not sure why this wasn’t released at barrel proof (to enable a broader release, maybe?) but one hundred proof isn’t good enough for a $130 limited edition when the same line has a single barrel at 120 proof at $50. If you have the room in your budget to blow $130 on a good bourbon that isn’t great, then you might like this. If you’re a normal human being and not a tater like me, then you might want to skip this. Reports are that batches 2 & 3 may be better, but this batch isn’t close enough to a fair price for even a mild recommendation. Knob Creek Limited Edition, 2001 (batch 1) is not recommended. Appearance: Bright chestnut with a clingy robe. Nose: Crushed walnut, bubblegum, caramel, allspice, dried Cayenne. With water the Cayenne turns to sweet cinnamon. Palate: Medium bodied. Caramel on entry, then burn. Turns chewy and spicy with water. Finish: Grape bubblegum, alcohol. Water brings out the oak, but doesn’t turn down the heat. Parting words: Old Forester 1920 is the third installment in the Old Forester Whiskey Row Series. The first, Old Forester 1870 (in honor of the founding of the company), was released in 2014, 1897 (in honor of the Bottled-in-Bond act) was released in 2015. This one, released in 2016, was named in honor of the fact that Brown-Forman was one of the handful of Kentucky distillers that received a license from the US government to distill spirits for medicinal purposes. So it was actually possible to get Old Forester during Prohibition, with a prescription. It is 115 proof, not because that was the proof at which OF was sold in those days but because that was a common proof at which Old Forester came out of the barrel at the time. All three Old Forester Whiskey Row bourbons have been good. This one is the best. It is what we OF fans have been waiting for. It does an excellent job of balancing the spice and oak of older OF with the fruity roundness of younger OF. It does this without falling into the weird plastic aromas and unbalanced oak that can come into some of the Old Forester Birthday Bourbon vintages. 1920 is both elegantly balanced and powerful, like a JS Bach organ composition or a Brahms symphony. This is the Old Forester I had hoped B-F was capable of producing all these years but thought I would never see. Now all I can think about is the next installment. Single barrel? True barrel proof? Distillate of DSP KY 414, the old Old Forester plant? I can hardly wait. Old Forester 1920 is highly recommended. Nose: Grilled peaches, oak, fireplace ash, cigarette smoke (Marlboro-ish), high corn bourbon, peat. Palate: Full bodied. Butterscotch, peat ash. Finish: Alcohol, dry chipotle chilis, sherry, fairly short. Parting words: Is there better way to end 2016 than with a review of a whisky that was released in 2015? Yes, many better ways. I decided to review this anyway, since I picked it up late this year. Perpetuum was released in 2015 to commemorate the 200th anniversary of the Ardbeg distillery. Many distilleries in Scotland were “founded” around 200 years ago. This is no coincidence. Beginning in 1816 and culminating in the excise act of 1823, the UK government passed a series of laws creating a level playing field for distillers in Scotland vs those in Ireland and England. Many illegal distillers went straight, refounding their operations and many new distilleries started up. Perpetuum is a very good whisky. It’s classic Ardbeg: smoky, spicy, but still complex.Problem is, I’m not sure it’s good enough to justify the $20 markup over Uigeadail which is very similar. The well-reviewed and higher ABV Corryvreckan is $10 cheaper, too. So while Perpetuum is very good, it’s not a very good value. Ardbeg Perpetuum is mildly recommended. Appearance: Auburn with long, regularly spaced legs. Nose: Alcohol, leather, barrel char, citrus blossom, Genoese basil. On the palate: Full-bodied and rich. Burn, purple Kool-Aid, oak, ginger, mace, brown sugar. Finish: Fruity in the cheeks, dry on the tongue and the actual palate. Parting words: This is Wild Turkey at its finest, complex but still powerful. It strikes a lovely balance between fruity sweetness, spice, alcohol and oak, even without water. Compared to its siblings, I would rank Tradition above American Spirit (some of my friends might reverse that ranking), but not as good as Tribute. It’s a perfect holiday or special occasion sipping bourbon. The packaging is absurdly complex with a display stand covered by a chestnut colored cover, but the bottle itself is simple and elegant. The over the top packaging does mean that it travels and ships well, so that’s something. Tradition was released in 2009, but I was still seeing them on shelves as late as a year ago. The price is steep for a bourbon but these limited edition Turkeys rarely disappoint, and it is officially a dusty now so if you see it for $150 or less, buy it. 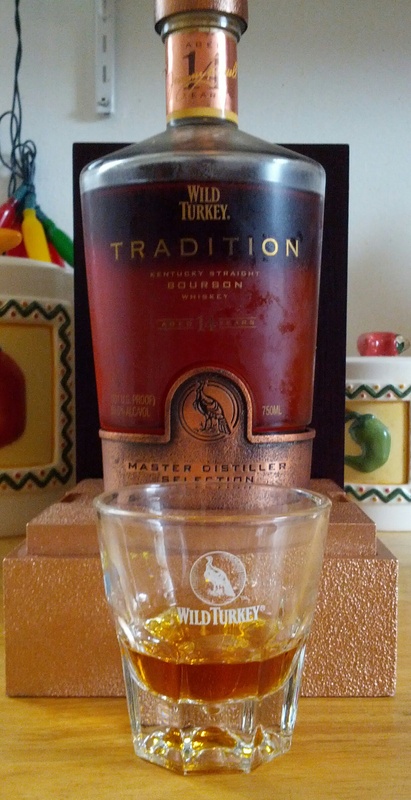 Wild Turkey Tradition is recommended.